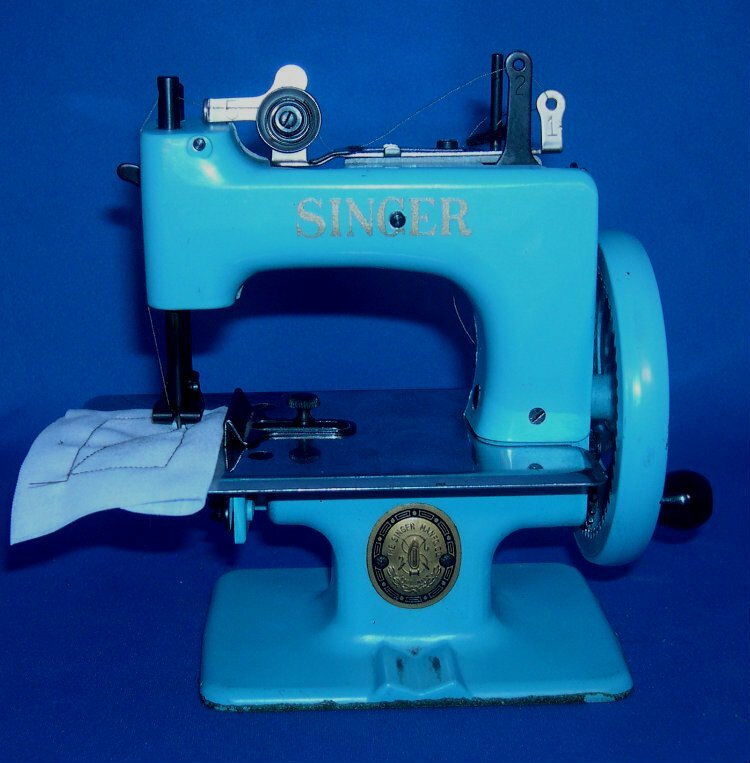 This is a Vintage Original Pale Blue Singer Toy Sewing Machine put out by the Singer Sewing Machine Company from 1954 - 1957. It is a Model 20-10 and sometimes referred to as a Sewhandy. These are HARD TO FIND because there were not nearly as many of them made like the black or tan/brown toy machines by Singer. They were manufactured in Monza, Italy. The "Pale Baby Blue" Singer has some of the same features as the more common Singer toy machines such as the same decals with the Singer name in large letters, the gold and black medallion, a nickel plated sewing plate, threading assist numbers on the top, a rectangular bottom and a 7 spoke wheel. Most of the colored Singers come with black fittings (sew bar, foot, seam gauge, etc.) instead of the nickel plated ones. Through our years of collecting these little machines we found out that there are actually two different shades of blue Singer toys. The other blue is somewhat darker and quite unique. This machine comes with the box, a clamp and instructions. The clamp is not the original clamp but one that has been painted the same color. There is also a little book titled, "How to Use Your Singer Sewhandy Model 20 Sewing Machine". This brochure is still in tact but has marks on the front and back cover where someone stitched through the cover - straight lines of needle holes. It contains instructions for using the machine and some of the maintenance for it. This machine sews a chain stitch and is ready to sew. There is no rust but there are a couple of very small places on the edge of the wheel were paint is missing and where the clamp has been used but that is not much. We also sell the correct needles required for this Singer elsewhere on our website. Why not surprise someone you know with a great Christmas or Birthday present. Maybe even a gift for yourself! Kept in a smoke free, pet free environment. It will be carefully packed and insured.